I’ve been on a real L.M. Montgomery kick lately. Immersing myself in the world of Prince Edward Island is a pretty nice way to usher in the summer. And as I re-read old favorites and dive into new titles, I find myself consciously acknowledging something I’ve suspected for a long time. It’s an inconvenient truth, one that I think verges on blasphemy to many of her fans. I have realized that I like Emily of New Moon more than I like Anne of Green Gables. If you haven’t read the Emily books, you’re missing out. There are three of them, starting with Emily of New Moon, first published in 1923. They start when Emily is a young child, dealing with the death of her beloved father (which happens almost immediately in the story) and adjusting to the experience of being taken in by her late mother’s family. She has two maiden aunts named Elizabeth and Laura, a martinet and a sweetheart, respectively. They share a home with Cousin Jimmy, a middle-aged man with a child’s spirit, a developmental quirk which is widely attributed to the fact that he fell into a well as a child…or was he pushed? (Anyhow, remember that about the well. Wells play a surprisingly sinister role in this book.) Emily immediately falls in love with their beautiful old Prince Edward Island farmhouse of New Moon, with its gardens and orchards and fields and family lore. She suffers the typical growing pains of any sensitive child: loses a fake friend, makes a close friend, makes mistakes, deals with the inflexibility of the adult world and its often irrational demands, and reaches womanhood in the subsequent books, Emily Climbs and Emily’s Quest. I first came upon these books in sixth grade. It’s perhaps a sign of their influence on my life that I can still vividly recall the mall bookstore (long since vanished) where I bought Emily of New Moon, and I can remember that I started reading it in the car on the ride home, and didn’t look up until about half an hour later when we pulled into our driveway. Not too long after that, the Anne of Green Gables miniseries was first broadcast on TV. I taped it (back in the days of VHS tapes!) and watched it countless times and adored it. Likewise, I loved the sequel, Anne of Avonlea, which was broadcast a few years later. And I read the book Anne of Green Gables, too, and found it just as charming as the TV series. But I have to say, looking back, I haven’t returned to Anne too often. I’ve read Anne of Green Gables maybe three times over the past thirty-plus years. The Emily books? I’ve read them at least ten times, by my best reckoning. That tells me something. It’s clear that when it comes to Montgomery heroines, Emily has an appeal for me that Anne somehow can’t quite match. There are a few reasons for this. I’ll try to explain them here in such a way that I don’t spoil anything in the Emily trilogy for those of you who have yet to read them. 1) Emily has dark hair, like mine. I know that sounds pretty shallow, so hear me out. I grew up in the seventies and early eighties, long before the Disney Beauty and the Beast, with its refreshingly brunette heroine. In my childhood, every Disney fairytale heroine had blonde hair (except Snow White, but I mean, who can like Snow White? ), and all throughout my tender years I was hungry for a heroine who looked like me. If redheads can identify with Anne, I can identify with Emily, and identify I did. 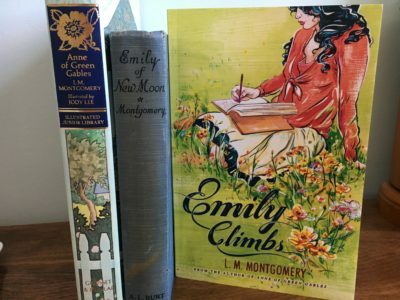 Montgomery constantly writes about Emily’s appearance: her dark hair, her violet eyes, her slightly pointed ears, her tall, queenly bearing. I have only one of these four traits, but it was enough. And unlike the Little House on the Prairie books, where we are told ad nauseum that Laura’s brown hair is really ugly compared to Mary’s blonde curls, the Emily books make dark hair part of the heroine’s unconventional, mysterious beauty. That’s affirming for a kid. And an adult, too. 2) Emily is a writer. Anne is too, I know, but in Emily, it runs deep. There’s a part in the second book where her pragmatic aunt Elizabeth, who wants to cure Emily of her scribbling habit, offers her a chance to pursue her education as long as she promises to stop writing. Emily doesn’t even need to think about it; she immediately turns the offer down. Writing is so much a part of her that she literally can’t give it up, not even for something she longs to do. I can relate. 3) Emily is an introvert. 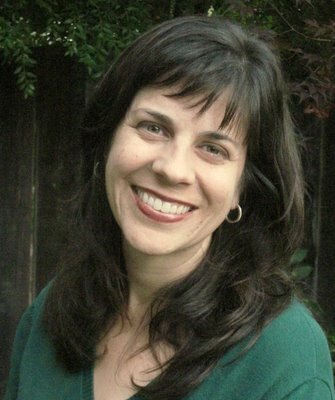 She has some close friends and is fiercely connected to her family, but she spends a great deal of time alone: wandering in the woods, thinking, pondering, and – delightfully – writing. My favorite parts of all three books are the journal entries that she writes, where she processes her feelings alone. Anne, with her delightful garrulousness, makes a charming heroine and would be, I imagine, a fun person to hang out with (more fun than Emily, maybe). But as an introvert myself – something that was even more pronounced when I was a child – it’s gratifying to see a heroine who is fascinating even though she isn’t the life of the party. 4) The Emily books have a certain intensity and darkness to them. Not that the Anne books are all sunshine and rainbows (sniff*Matthew*sniff), but the Emily books venture a little further into topics that are not comfortable. There is a mysticism to Emily as a character that is fascinating and, at times, a little unsettling (for her as well as the reader). In the third book, she ends up in what we today might call a toxic relationship – all the more unsettling because it is in some ways an affirming friendship that gets warped into something that the astute reader can tell is not going to end well for her. It’s a far cry from Anne and Gilbert. And though I like sunny happy stories as well as the next girl, there is something in the Emily trilogy that has always struck me as being more … substantial. More like real life, maybe. I should add that there are things about the Emily books I don’t like. The character of Dean Priest is one that absolutely NO editor would allow in a child’s book today; there are troubling aspects to him that escaped me as a tween but make me blanch as an adult. I also think the third book, Emily’s Quest, is not entirely successful as a finish to the series. And I should come clean and admit that, if we’re talking about series, I’ve never read past the third book in the Anne of Green Gables series. I’ve tried, more than once in fact, but I always get bored and abandon it. I used to feel bad about this, but then I read Nancy McCabe’s book From Little Houses to Little Women and realized why I don’t keep reading: Anne grows more conventional as she ages, and therefore less interesting as a character. The conflicts become less about her struggles to define herself against a society that doesn’t understand her, and more about her involvement in the lives of the people she knows. Emily, by contrast, is always the center of struggle in her books. Though she does grow and change throughout the books, her fascinating self – creative, mystical, a little prickly, stubborn – remains mostly intact throughout the series. I’d rather read about her inner life than about Davy and Dora. So I remain resolute in my affinity for Emily over Anne. Maybe you agree, or maybe you disagree; either way, I’d love to hear your thoughts. But though Anne may be, as Mark Twain once said, “the dearest, most moving and delightful child since the immortal Alice,” I get something from Emily that I don’t get from Anne. And even at age forty-five, it keeps me coming back. This entry was posted in Mmmm .... books. Bookmark the permalink. I loved the Anne series as a child, and reread them all about 7 years ago when I tried to get my daughter to read the books. The only one I didn’t enjoy was “Anne of Ingleside,” the sixth book. I felt that Anne would have been annoying if she hadn’t matured at all, but I liked that as she became more sensible, she continued to find the good in people. When I finished rereading the series, I thought I’d like to read Montgomery’s Emily series as well. But I never did. So I’m grateful for the reminder. I’ll put them in the list for the summer. Maria, thanks for the comment. 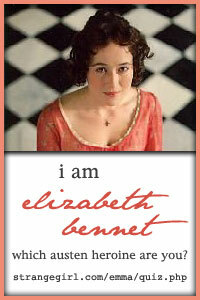 I’d love to hear what you think of the Emily books when you’ve read them. The gorgeous P.E. Island setting is the same in both series … and that’s always a winner. I have pretty much read every L.M. Montgomery book (including all short story collections) – my favorite being The Blue Castle. The funny thing is, like you, I identified a lot with Emily. But I think I just love the writing of The Blue Castle, there are parts of it I know by heart. And well, I could write a whole email about it :). I do recommend trying to make it through all of the Anne books because Rilla of Ingleside is good. It’s darker as it takes place during WWI and as you can imagine, time of war, not all news is good news, but, given you are such a Downton Abbey fan, I think you’ll like reading about the time period + L.M. Montgomery characters. I certainly enjoy it for that. Have you read A Tangled Web? That is a fun one. I think overall having Anne, Emily, Pat, etc. as the girls I grew up with, was just the best way to grow up. I’m definitely overdue for a re-reading of everything! PS – Completely agree about Dean Priest! Viki, I wish we could talk about this over coffee instead of online! So much to say! A Tangled Web is next on my reading list (as soon as I finish the non-L.M. Montgomery book I am currently reading). And I just re-read The Blue Castle last week … the same copy I bought in high school. It was so delightful, esp the descriptions of the island home. So idyllic. Can I read Rilla of Ingleside without reading the ones before? What you said about it does intrigue me. And Dean Priest: yes. Total creeper. Loved this post, Ginny. Although I know you have loved Emily for years and years, I have always been faithful to Anne. You have just convinced me to meet Emily! Yay! I hope you enjoy her story. I think you could read Rilla without all of the others – have you read Anne’s House of Dreams? That will give you background to characters in Rilla. I may go back and reread it myself just to be sure. I haven’t read Anne’s House of Dreams … maybe there’s a Sparknotes version? (I sound like my students!). Rilla of Ingleside definitely sounds good but I’m not sure I have it in my to read through all of the Anne books to get there. Or maybe I’d love them more than I think I would?